Home brewing can be pretty damn confusing, especially when you’re on the outside looking in. It looks a lot like performing brain surgery, even though it’s a lot more like brewing a stew. There’s lots of complicated jargon and mysterious acronyms thrown around. One of the three home brewing books that helped me make my way through the fog was Homebrewing For Dummies. Until recently, I avoided the For Dummies books like they were evil. I thought that I was too advanced for them, however I’ve found a number of them useful and a lot more helpful to a beginner than some of the more in-depth books. Of course, the most useful one was Homebrewing For Dummies. 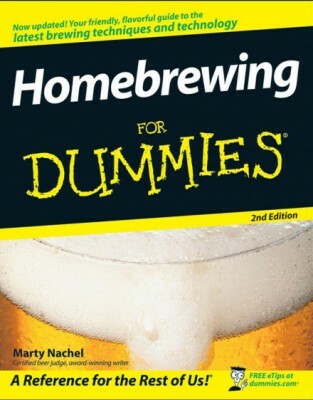 Homebrewing For Dummies is written by Marty Nachel. Marty is a certified beer judge (how do I get that job?) and award winning beer writer, so I’m thinking he knows what he’s talking about. He breaks down homebrewing into quick, easy to read segments. He starts the book out by getting you completely setup for your first brewing day, taking away all of the mystery about equipment, sanitation and ingredients. Then he walks you through making your first beer and makes sure you don’t get lost on any of the steps. Once you’ve got a few beers under your belt, he covers more advanced topics like Partial Mash and All Grain Brewing. Of course he also covers how you can evaluate your beer and how to trouble shoot it if you find any problems. He also shares his tested recipes covering everything from ales to lager and everything in between. My favorite sections of the books are the “Top Ten Gizmos That Can Make Home Brewing Easier” and the answers to the FAQ’s. Both of the sections definitely filled in some blanks for me. If you’re lost in the home brewing woods and need a little expert advice, check out Homebrewing For Dummies.